We are currently taking reservations for the 2018 Pavilion Rental season (May-September). All pavilion rentals must be arranged in person at the Moon Parks and Recreation office in Moon Park, located at 1350 Ewing Road. Please call 412.262.1703 for more information. Please Note: Due to the Moon Park playground redevelopment, the Saturn pavilion will not be available for rent in 2018. Also, the main playground at Moon Park will be closed to the public. All pavilion rentals must be done in person. All deposits and fees are due at the time of rental. All pavilions have a $100.00 deposit, in addition to fees. All pavilion use requires a signed contract. All pavilions have electric and water. 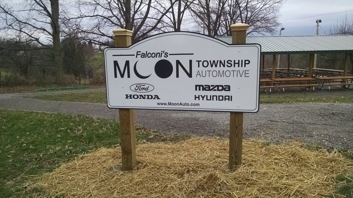 All pavilions have horseshoe pits except the Falconi pavilion. Alcohol Beverage Clean-up permits are available to purchase for $30.00.